Take a break from everyday stress and hassle with the TAKA Turmeric Golden Latte. Delectably smooth, and caffeine-free, the Golden Latte recipe combines a soothing blend of mild spices with organic turmeric and coconut milk powder. A favourite Indian drink, also known as haldi doodh or golden milk, this instant turmeric latte mix is especially comforting as an evening or bedtime treat. Organic Coconut Milk Powder (38%) (Organic Coconut Milk 97%, Organic Tapioca Maltodextrin [derived from Organic Yuccao Root] & Organic Gum Acacia), Organic Turmeric 32%, Organic Ceylon Cinnamon, Organic Ginger (9%), Organic Black Pepper, Organic Cayenne Pepper & Himalayan Pink Salt. To make a delectable Golden Latte, add 1 teaspoon of this mix to a mug with a little hot water to make a paste. Then add 200ml of hot milk or a mixture of hot water and milk, stir up, steep for a few minutes and enjoy as is or sweeten to taste. 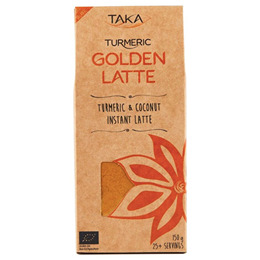 TAKA Recommends: Using your choice of hot frothed milk and add agave syrup for the ultimate Golden Latte experience. This is an organic spice blend that may create some sediment. To avoid the sediment, make your latte in a French press or a tea plunger. Below are reviews of TAKA Turmeric Golden Latte - 150g Powder by bodykind customers. If you have tried this product we'd love to hear what you think so please leave a review.